It’s been forever since I joined in on Slow Cooker Thursday. I have been mostly been using my crock for the same ol’, same ol’ things so haven’t had anything new to post. Well, that and TIME to post seems to be a premium for me these days! We’ll have to see if I can get that turned around a bit… Due to my schedule being a bit different now, Wednesdays are the big slow cooker day in my house. When do you use yours? 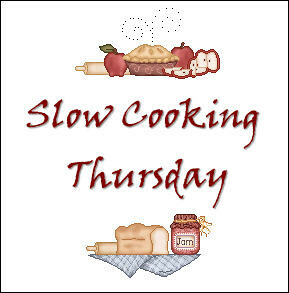 Head over to Sandra’s for Slow Cooking Thursday and join in the fun! This is a hold over from our vegan days (I only used roasted veggie stock for it then). If you would like greens in it, add spinach and tender cooking greens (washed and coarsely chopped) right at the end of cooking time. If you are adding kale or tougher greens, allow to cook with everything from the beginning. How much? Just toss in a couple of handfuls until it looks good to you! This makes a big amount of stew, but it freezes well, so stock your extra amount away for a busy night this holiday season. I like to freeze this in individual containers for lunches. In a 6 quart slow cooker combine stock, squash, chickpeas, carrots, onion, lentils, tomato paste or pumpkin puree, ginger, garlic, cumin, salt, pepper, and turmeric. Mix well. Cover and cook on low for 7-9 hours or on high 3 1/2-4 1/2 hours. Serve with a sprinkling of chopped peanuts and cilantro with a wedge of lime. This entry was posted in Dairy Free, GFCF, Gluten Free, Grains & Legumes, Slow Cooker, Veggies. Bookmark the permalink. This sounds really good. I have a ton of squash to use. Thank you for sharing. If you use pumpkin puree verses tomato paste does it change the soup at all flavor wise? Have a great week. I make a crock pot version of this that is quite similar. It is such a filling, warming and homey soup. Thanks for sharing it. I host Crock Pot Wednesday at Dining With Debbie and would love for you to join me there sometime. Have a great weekend.